Russia used cyberattacks on U.S. political institutions and social media to sow discord during the 2016 elections but did not collude with the Trump campaign, a yearlong investigation by the House intelligence committee concluded on March 12. “We have found no evidence of collusion, coordination, or conspiracy between the Trump campaign and the Russians,” said the committee, in a statement on the conclusion of its bipartisan investigation. The committee plans to submit its report, which is based on 73 witness interviews, 230 hours of testimony, nine hearings and briefings, and nearly 308,000 documents, for review so that a declassified version can be made public. The committee said that it concurred with the intelligence community’s assessment that Russia interfered with the 2016 elections, but not with the fact that Putin had a preference for then-candidate Donald Trump. The intelligence community’s assessment, overseen by then-Director of National Intelligence James Clapper, had found no evidence of collusion between the Trump campaign and Russia. 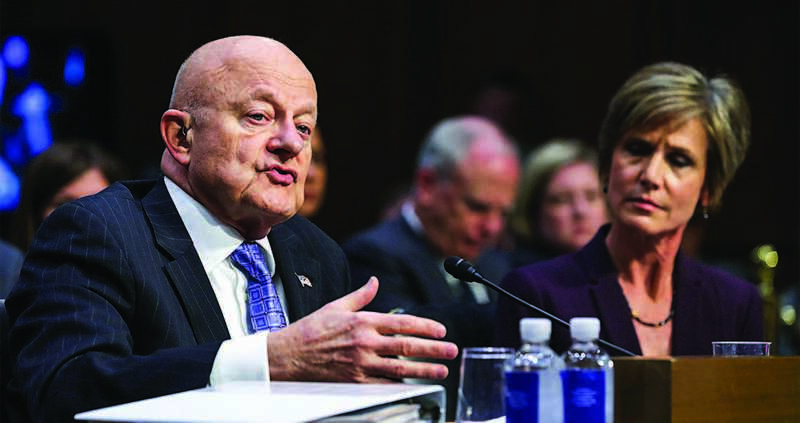 Since leaving office in January 2017, Clapper has said on multiple occasions, including under oath before Congress, that his investigation had found no evidence of collusion. Despite the lack of evidence to support the claim that Trump colluded with Russia to win the elections, it has been one of the main lines of attack used against him. Research by the Media Research Center found that ABC, CBS, and NBC spent a disproportional amount of time covering the collusion theory in their evening newscasts. Between Jan. 20, 2017, and Dec. 31, 2017, the networks spent a combined 1,234 minutes covering the alleged Russian collusion on evening news broadcasts. By comparison, the second most covered topic, the repeal of the Affordable Care Act, received a total of 475 minutes of coverage, and the North Korean nuclear crisis 364 minutes. Ranking member of the House intelligence committee Adam Schiff (D-Calif.) has been one of the main proponents of the Russia collusion narrative, giving hundreds of interviews to media organizations on the matter over the past year. The congressman has claimed in multiple instances to have seen evidence showing collusion; however, none of those have come to fruition. Schiff said in a statement that he objected to the conclusion of the committee’s investigation. An investigation by special counsel Robert Mueller is still ongoing. Indictments made by Mueller’s office so far do not show any evidence of collusion. The final report by the House intelligence committee will also address the “lackluster pre-election response to Russian active measures” by the Obama administration, which was aware of the Russian efforts. The committee’s investigation also addresses how Russian disinformation from former and current officials connected to the Kremlin made its way to the campaign of then-candidate Hillary Clinton. The Clinton campaign and the Democratic National Committee had paid Fusion GPS to produce the so-called Trump dossier, which relied almost exclusively on Russian information. The information was then actively spread among media organizations and politicians in an attempt to smear then-candidate Trump. Sen. John McCain (R-Ariz.) admitted in a statement in January last year to have personally delivered a copy of the dossier to then-FBI Director James Comey. 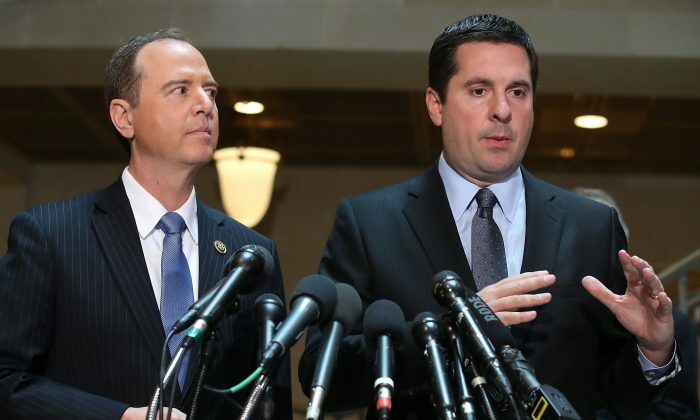 A separate memo released by the House intelligence committee in February showed that the dossier played a crucial part in the FBI and Department of Justice (DOJ) obtaining a FISA warrant on Trump campaign volunteer Carter Page. In using the dossier, however, the FBI and DOJ failed to tell the Foreign Intelligence Surveillance Court the source of the information and its connections to the Clinton campaign and the DNC. Separate court documents from the UK, where former British spy Christopher Steele is being sued by a Russian businessman for libel, shows that secret briefings were given to media on the contents of the dossier during the election. Steele’s defense attorney stated in the court documents that Steele was instructed by Fusion GPS to brief reporters from The New York Times, The Washington Post, The New Yorker, CNN, and Yahoo News on the contents of the dossier. The briefings were done in person and verbally. Steele also “participated in further meetings at Fusion’s instruction with Fusion and The New York Times, The Washington Post, and Yahoo News,” according to the court documents. Bank records obtained by the House intelligence committee also showed that Fusion GPS made direct payments to a number of journalists who reported on Russia-related topics. During Trump’s first year in office, his administration was plagued by dozens of leaks of classified information.